Well, this is it. The day all my dreams came true. I started out playing 2D side-scrollers in mall arcades in the 1980s, but I’ll soon be able to fight holographic robots bursting through my living room walls using my handheld blaster that’s a wearable hologram. WTF. 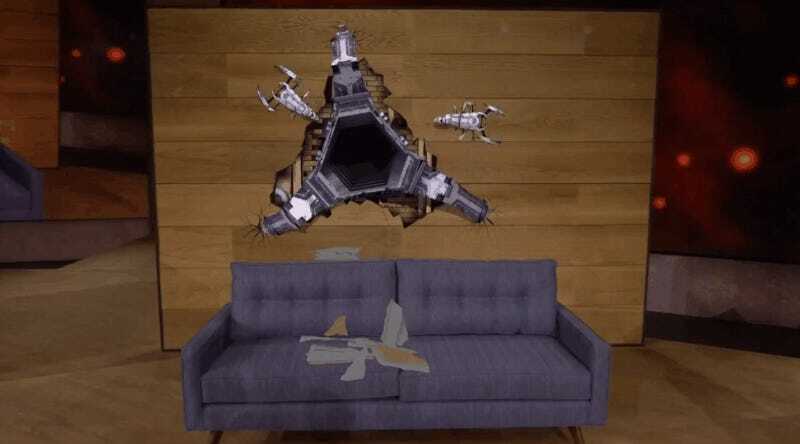 Today at Microsoft’s October 2015 event in New York, the team kicked off their new products announcement with a live HoloLens demonstration that pitted one headset-wearing Microsoft employee against arachnid alien bots crawling through a living room situation in what the company is calling “mixed reality gaming.” The demoed gameplay, codenamed Project X, allows you to defend any room in your home (or any other building) against encroaching alien invasion. Oh yeah, and it’s tether-freaking-free. No wires, no cords of any kind. No phone required. No connection to a PC required. These killer robots are smart, too. Sensors tell the game’s foes where furniture and walls in the room are, and the baddies take this into consideration when they’re scheming an offensive against you. But your holographic weapon—which again, moves with you as you play—can morph into different tools. The demo player on stage initiated “vortex mode,” turning his blaster into a vacuum that sucked an alien to his fist and then launched the critter against a wall where it splattered to its doom.